2 inch Kensington finial for 2 inch wood pole 6 1/4 inch returns. Finials for curtain rods by Kirsch. For 1" diameter wrought iron curtain rod pole. Wrought Iron Collection by Kirsch. A striking expression that is both organic and sophisticated, the new Wrought Iron Collection can complement and design vision. Diameter: 4 3/4" x 2"
3 1/2" return 1 inch wrought iron curtain rod brackets. Five finishes: Black, Rust, Iron Oxide, Iron Gold, and Antique Pewter. 7 per bag, OD 2 1/8", ID 1 5/8". C-rings have a space in the ring that allow the rings to be drawn across the center bypass support bracket, 56372. 7 per bag with clips. Outside diameter 2 1/8" inside diameter 1 5/8". Base price is for antique pewter and iron gold. Other colors are less and will be reflected in the basket. Single and double brackets, holdbacks, rings, finials and a stoutly made 1" rod dazzle in five finishes: Black, Rust, Iron Oxide, Iron Gold, and Antique Pewter. Antique drapery rods for corner curtain rod installations or bay window. Five finishes: Black, Rust, Iron Oxide, Iron Gold, and Antique Pewter. Swivels to any angle from 180 to 90 degrees. 1-621-8: Alexandria decorative drapery curtain rod crown finial 28-48"
1-622-8: Alexandria decorative curtain rods crown finial 48-84"
1-623-8: Alexandria , decorative curtain rods crown finial 66-120"
1-6252-8: Alexandria large window decorative curtain rod crown finial 130-240"
Window curtain rods & hardware for laa your projects. 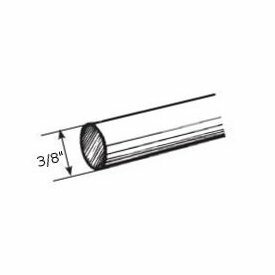 This 1 3/8 inch diameter Kirsch designer metal telescoping traverse rod poles comes in six new colors. Sizes to fit windows from 38 inches to 270 inches wide. Each set includes plugs for finial and brackets for mounting. Ring slides included and twenty style finial options to complete your decor. Antique curtain rods for tab top curtains, eyelet curtains or pinch pleat draperies. 6 foot Smooth 1 inch metal curtain rod. Wrought iron curtain rod look. Some colors are more than base price. Stocked colors ship in 1-2 business days, custom colors ship is 5 business days. Stock Colors: Black, Antique Gold, Rust. clearance 2 to 3 1/2 inches traverse. Includes cord tension pulley.